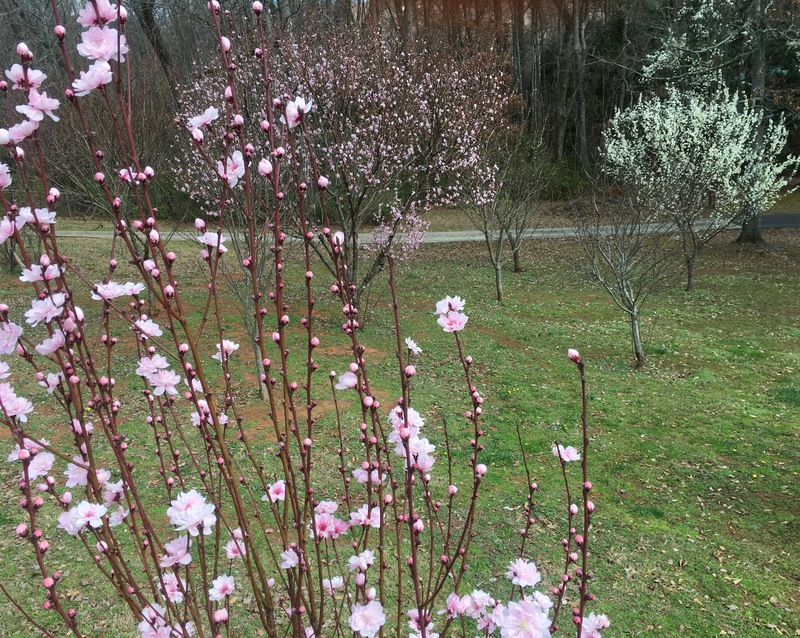 Our fruit trees are blooming on Paris Mountain. It’s almost eight years since we established our homestead here on Paris Mountain. Mr. Mims planted some fruit trees the first year, and a few more the next couple of years. We have apple, pear, plum, nectarine, cherry, and peach. At first they were like twigs that we could hardly see. Now we appear to have a small orchard. Last summer we got pears from one tree, but the squirrels stole all our pears from another. We have never seen a cherry yet, and suspect that it might be an ornamental variety. We’ve had a few small peaches and plums, but we’re still waiting for our summer of fruit. It is difficult to grow fruit here without applying chemicals to ward off disease and insects. But we figure that eventually there might be enough for us, the squirrels, the birds and the bees. That nasty mold and fungus is another story. But right now they sure look beautiful in bloom don’t they?